← Straits Times’ Deepika Shetty and illusions of granduer: What does ‘well-heeled’ mean exactly in the world of art-appreciaters?? Perhaps this is one of the best-kept public-art secrets in Singapore; sometime in the late 1990s, the Singapore government approved the purchase of a $15,000,000 (should be US$, I think) art-collection from a very prominent print-maker (click ‘here‘ for news of the purchase). This is a collection of 1,200 prints owned by Kenneth Tyler (click ‘here‘ to know more about him), who is acknowledged to be among the best print-makers around and who had worked with the most prominent artists since the 1960s, including pop-artists such as Lichtenstein, Hockney and Stella. I was privileged enough to have seen the entire collection in Singapore when it first came; one word…. “STUNNING”! The funny thing is, since then, this collection – which would make most of the larger contemporary art museums in the world green with envy – has very seldom seen the light of day in Singapore. I would’ve thought that this collection alone would be a great anchor for a permanent gallery – if not an entire museum – on pop-art; but I’m not the arts minister am I? Instead, small numbers of these artworks are displayed from time to time at the Singapore Tyler Print Institute (which was set-up with the help of Ken himself), located at Robertson Quay (click ‘here‘ to learn more about STPI), and also at the Singapore Art Museum (click ‘here‘ for a past exhibition in 2009). Currently (from 20 May 2011 to 30 Jul 2011), prints of David Hockney’s – one of Britain’s most prominent artists this century – artworks are on display. I’m go see them soon and report again. But the point of this post is really one of bafflement. A $15million collection of some of the finest quality prints from the finest quality artists of the last 30-40 years, and once in a while, they show a few Hockneys for only 40 days????? 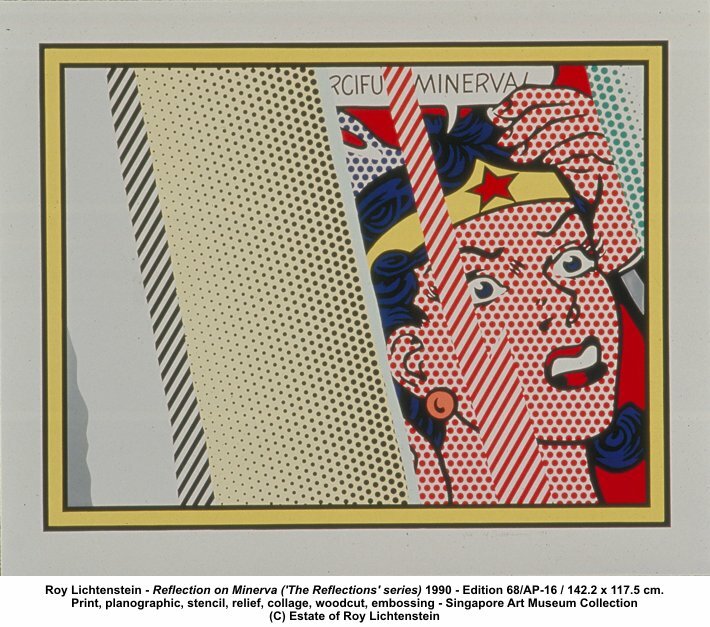 THE TRAVESTY (ala Wonder Woman’s angst in Lichtenstein’s work above…) ! ! ! ! !! ! ! ! ! ! !! The National Gallery of Australia in Canberra also holds a large collection of prints from Ken Tyler’s workshops. We’re working to make accessible to everyone through our website http://ow.ly/6djwA, blog and Twitter accounts. If you have any questions about Tyler and his work we’d be happy to help!